To celebrate British Food Fortnight starting on Saturday 23rd September Dan Bliss, Retail Manager at Paxton & Whitfield's flagship Jermyn Street shop, has selected the award-winning British cheese Devon Blue (Pasteurised cows’ milk, vegetarian rennet) as her Cheese of the Month for September. Robin Congdon of Ticklemore Cheese, located near Totnes in Devon, produces Devon Blue. The dairy is located in beautiful surroundings overlooking the Dart Valley and the Friesian cows' milk used to make the cheese is collected locally in the South Hams. Over the years that they have been making cheese the team has developed a close working relationship with trusted farmers who supply the milk as so many factors can impact its quality. These include the animals' welfare, their breeding and the pastures they graze on. Robin's history in cheesemaking is very interesting as he was one of the first pioneers in the 1970s to revive the tradition of milking sheep in the UK. He started off with thrity sheep on a smallholding near Exeter and initially produced yoghurt and soft cheese which he took to London once a week to sell. Within a few years he was introduced to Maurice Ash who was connected with the Dartington Hall Estate and the two went into partnership on a larger farm alongside the river Dart, where they are today. Here Robin developed Beenleight Blue, named after the hamlet in which it was first made, and later Harbourne Blue, named after the tributary of the Dart which flows through Beenleigh. Several years later he created Devon Blue using the cows' milk of a neighbouring farmer. Today Ben Harris is the head cheesemaker at the Dairy and Robin now focuses on other areas of the business as well as acting backup cheesemaker. Ben had previously worked in local restaurant catering before joining the dairy and working his way up to head cheesemaker. 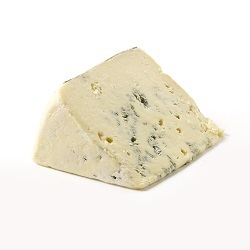 Devon Blue is a firmly textured cheese with a beautifully savoury flavour and a satisfying piquancy.